London is one of the largest metropolitan areas, urban zones and cities in Europe. At the same time, it is a prominent global city, featuring strengths in tourism, arts, development, commerce, research, education, professional services, media, healthcare, finance, fashion and entertainment. Taking into consideration the international arrivals, London is the most visited city in the world. At the same time, it features the largest city airport system and one of the world’s largest urban transport networks. The 32 boroughs in the city are spanned by road, river and bus systems. London is widely known for its symbolic red buses. They are a cheap, convenient and quick way of traveling in the city and they offer multiple sightseeing opportunities. Recently, the London bus system was improved and it received improved accessibility, more frequent services and new buses. As a traveller, you will have no problems in finding the bus routes you need, because in every tube station or travel information centre you will find the Central London Bus Guide. This map is going to help you get a glimpse over Central London’s transport system and will provide you immediate access to the world-renowned London landmarks. Being a major capital city with a vibrant and buzzy nightlife, London is also served by numerous night buses. There are London buses running 24/7 and there are also bus services that run between almost 0:00 am and 7:00 am. You should know that the night buses hub is Trafalgar Square. Moreover, remember that the night buses only stop on request. A one-way ticket with an Oyster card costs £1.40, but if you choose to pay by cash, it will cost £2.40. You can also use the London Bus Pass throughout the entire tram and bus network. 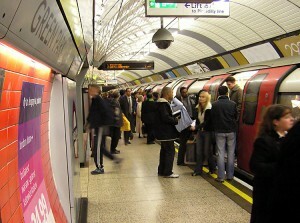 Another efficient and frequently used means of transportation in London is the tube. An interesting fact about the London Underground is that in 2013 it celebrates its 150th anniversary. There are 12 tube lines serving Greater London. They interconnect with the Docklands Light Railway and the local train network. The trains run from Monday till Saturday and the operating hours are between 5 am and 12 am. Keep in mind that on Sunday, there are reduced operating hours. The London transport map features 6 concentric zones. Central London is covered by Zones 1 and 2. The capital’s outskirts are covered by Zones 6 to 9. The best fares can be obtained by using a Travelcard or an Oyster card. The Oyster fare for a single journey is £2.40 and the cash fare is £4.50. The tube guides and maps are available for free in all the London Tube stations. The black cabs represent a real trademark for UK’s capital city. A journey with one of these cars will offer you a comprehensive London experience. You can hail a black cab on the street or you can take it from the designated rank located on the bus, Tube or mainline rail stations. The minimum charge for a London cab is £2.40. Also, keep in mind that the fares are metered, so the fare will depend on your destination. When you book a black cab on New Year’s Eve, Christmas Day, by phone or when you take it from Heathrow, you will have to pay extra charges. Sometimes, you might feel that the black cabs are quite expensive. In this case, you can always replace them with licensed private hire minicabs and vehicles. Their only disadvantage is that they cannot be hailed on the street. Instead, you can book them by email, by phone or online. They are much cheaper than the black cabs, but they don’t use a meter, so you should know beforehand booking the car how much the journey will cost. A trustworthy and licensed private hire minicab company in London is 247 Airport Transfer. It has some of the lowest prices and it offers services from and to all the important London airports. The prices for a 247 Heathrow Airport Transfer to Central London start from 33 GBP for a saloon car.